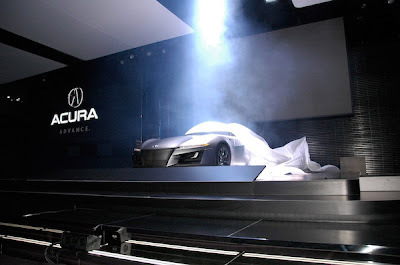 AboutAcura: [Rumor] Acura's ASCC No More? According to the Winding Road, "Acura has completely torn up the whole script and started over" for the Advanced Sports Car Concept (ASCC). Acura is starting over "in terms of how the finished car will look, although the basic proportions and front-engined V-10 package and all-wheel drive layout will stay" the same for the NSX's replacement. For a car that is supposed to be in showrooms around 2009, this is a little concerning. Even more concerning is that the "new NSX" is going to be priced around $150,000! I thought it was crazy when the original NSX cost around $90,000... For $150,000 can almost get you an Aston Martin DB9 (~$165,000). For a list of cars you can get for $150,000, click here.